"Ending the world got more complicated"
The sequel to Small Worlds! After managing to emerge victorious, Ryan, Crystal, and Athena still have that whole "end of the world" to get to. But first they have to figure out where Bast and Moloch went, why the Greek Pantheon is missing, and how the hell the US Government got its hand on homemade gods. Not to mention a host of other problems. New allies will be found...but will they be enough? 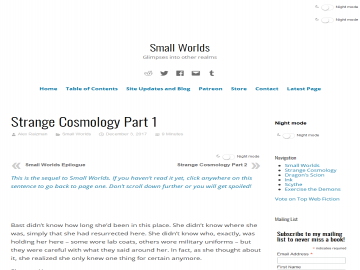 Strange Cosmology has not been reviewed yet. Strange Cosmology has not been recommended yet.